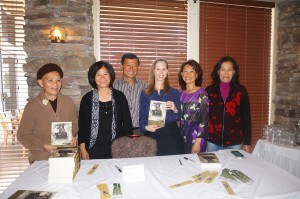 Read about my family’s adventure “Crossing the Street in Saigon” in The Rush Magazine. Join me at the Santa Barbara Education Office’s Annual Breakfast with the Authors. Saturday, Oct. 28 from 10 am – 1 pm. We’ll be dressing as our favorite literary character or author. Tickets are available here. 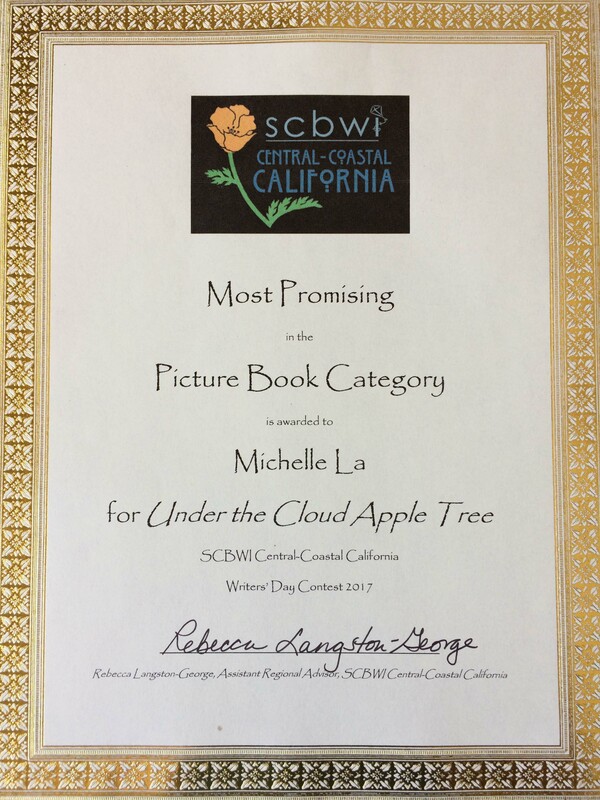 Under the Cloud Apple Tree, my work-in-progress, won “Most Promising” in the Picture Book Category at SCBWI CenCal’s Writer’s Day, Oct. 14. Aug. 12-13, I spent weekend writing poetry in a monastery thanks to Perie Longo’s Santa Barbara poetry workshop held at the Mount Calvary Monastery. Thanks to my son’s comment one day, I have this #cnftweet published in Issue 61 of Creative Nonfiction: Learning from Nature (https://www.creativenonfiction.org/issue/61). 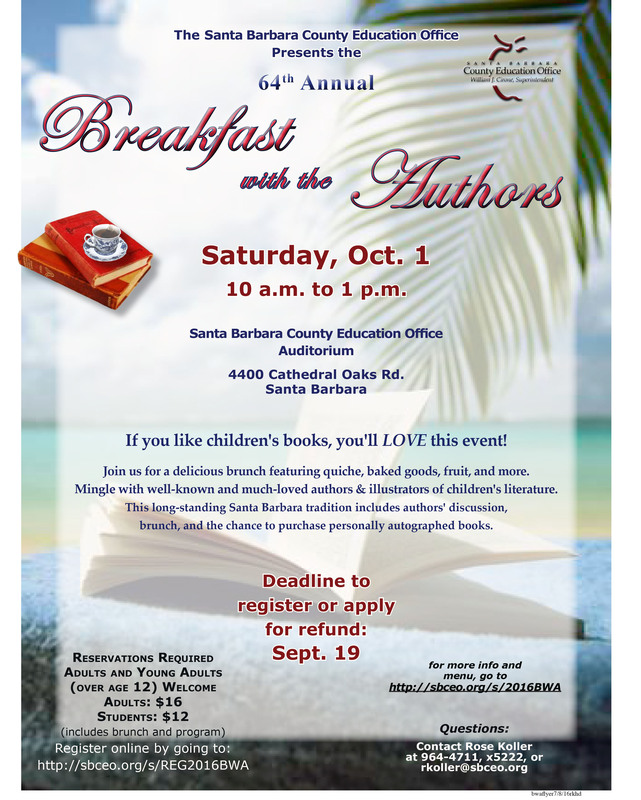 Join me at the Santa Barbara Education Office’s Annual Breakfast with the Authors. Saturday, Oct. 1 from 10 am – 1 pm. Tickets are available here. My poem “Smoking a Pot of Gold” was a finalist in Cha‘s “Addiction” Poetry Contest. I talk about my poem and the inspiration behind it on Cha’s blog here. 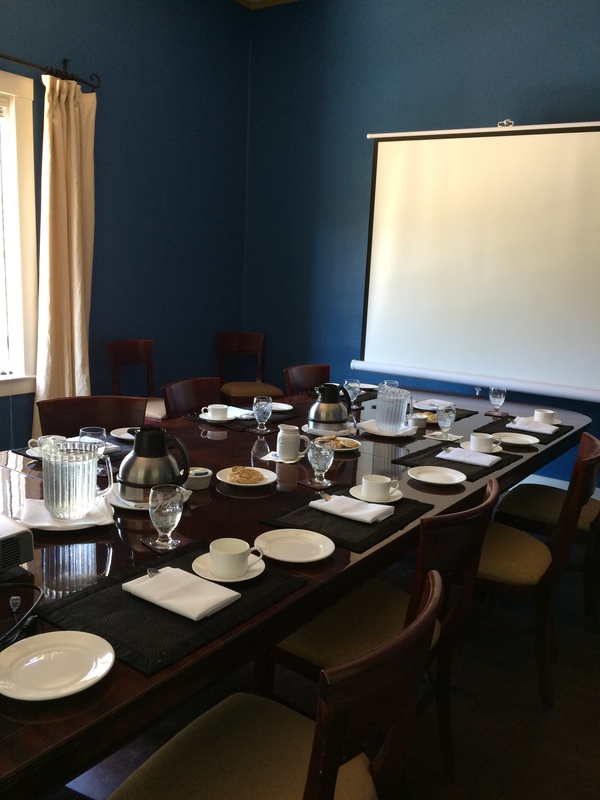 Aug. 1st, I had the pleasure of speaking to the Mermaids and Seraph’s Book Club in this charming room, the University Club’s Blue Room. I’ve been invited to present at several groups this summer. 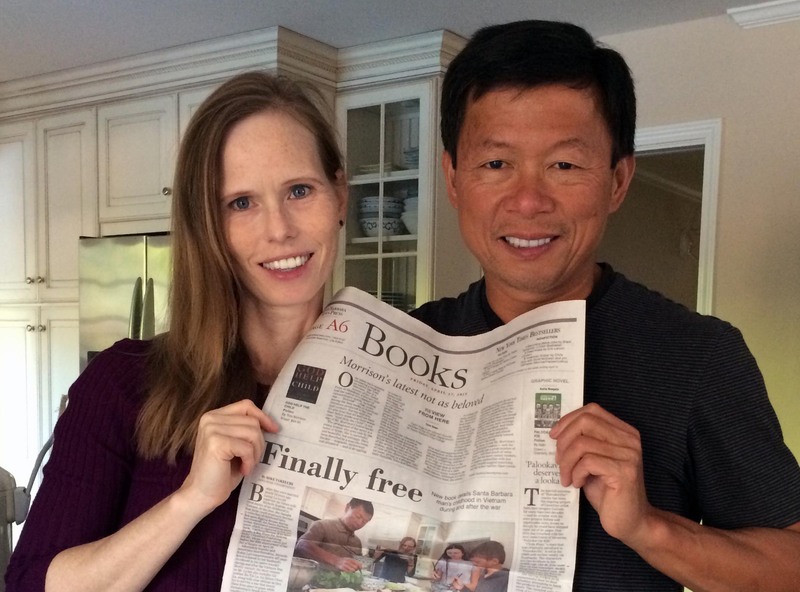 It’s always a pleasure, and I enjoy sharing my husband’s story. Let me know if you’d like me to visit your organization or book club! I’m honored that an excerpt from “Catching Shrimp with Bare Hands” is featured in The Missing Slate, an international arts and literary journal dedicated to upholding free speech around the world. 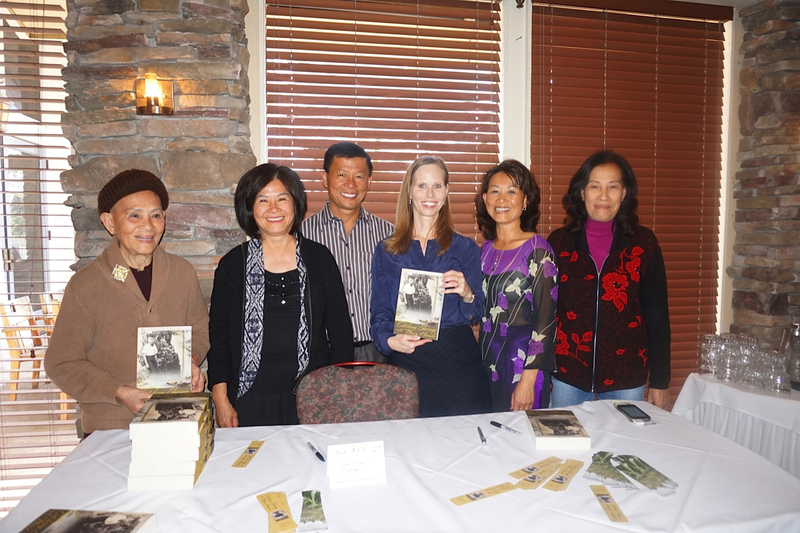 Attending the book talk are some of the people who are in the book, from left, Rose Le, Nancy Hue La, Luong La, Michelle Robin La, Young La Milton, and Lisa Tuyet Le. Rose Le is the mother of Luong, Young, and Nancy while Lisa Tuyet Le is their aunt. The Santa Barbara branch of the American Scandinavian Foundation will be hosting a talk about my book at the Goleta Library on Saturday, Mar. 5th at 3 pm. 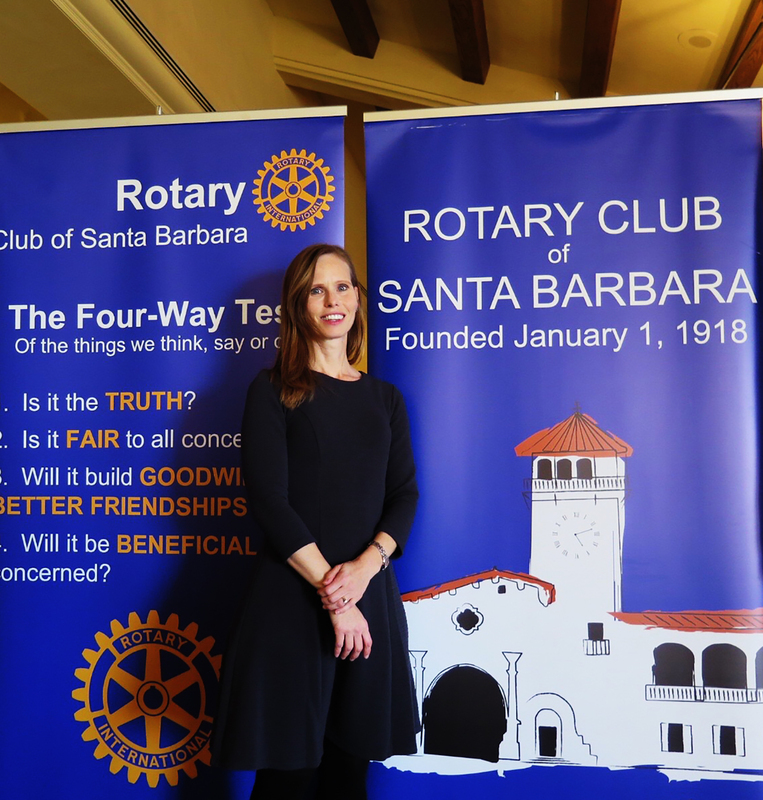 I’ll be speaking at Santa Barbara Rotary’s Friday lunch meeting at Fess Parker’s DoubleTree Resort on Feb. 5th. 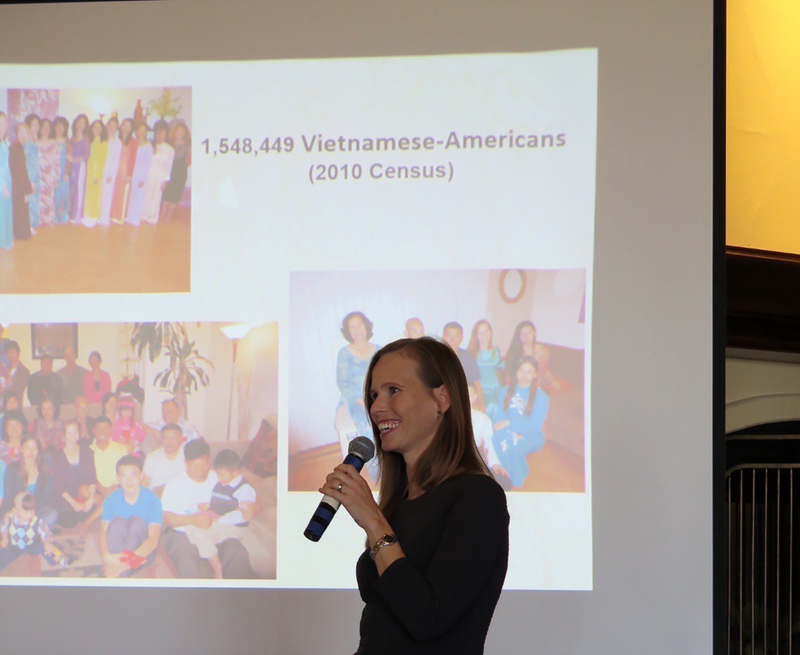 Thanks to Maravilla for inviting me to be their luncheon speaker on Jan. 25th! I’ve been invited to a variety of book clubs and always enjoy it. Let me know if you ‘d like me to come to yours! 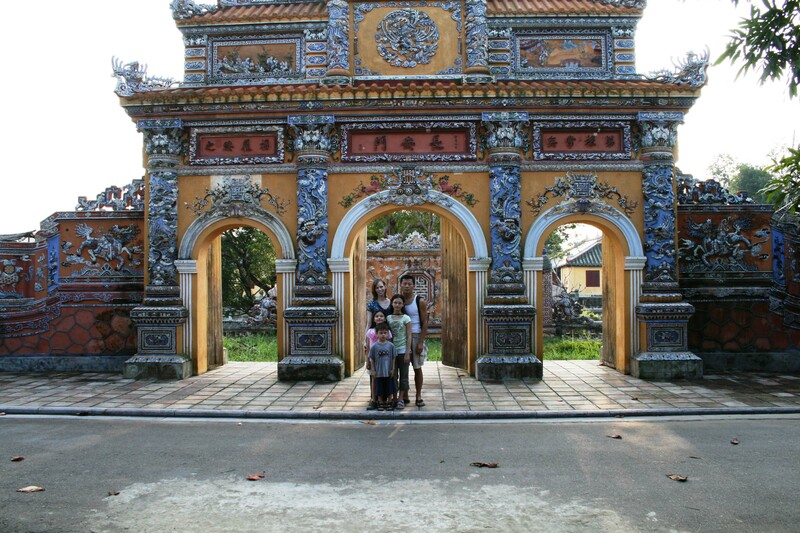 Fun to see our family’s trip to Vietnam in this article on heritage travel: ”Heritage tourism: Using travel to explore roots and culture” by Kristi Eaton for the AP. Read the article here. 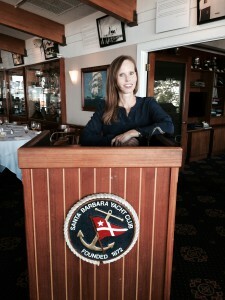 I’ll be the visiting author for the Santa Barbara Newcomer’s November Book Club meeting at 1pm on the 4th. At Bank of Books with Joye Emmens. Brain, Child Magazine featured my essay “Just One Box to Define My Child” as part of its Cultural Diversity blog series. 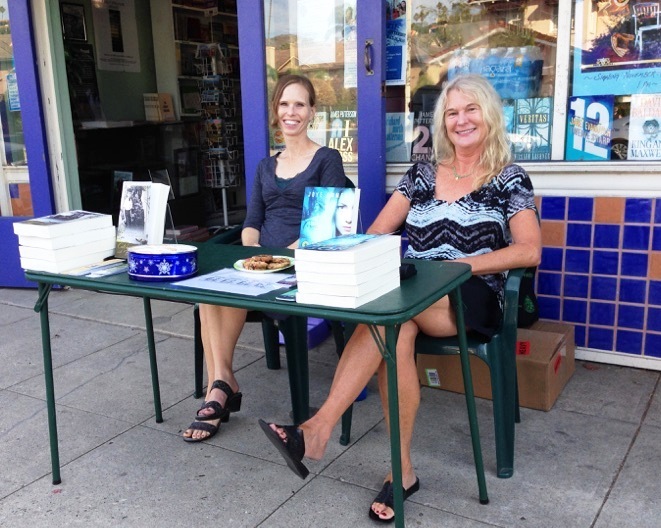 From 3-5pm on Saturday, Oct. 17th, I’ll be signing books at Bank of Books,748 E. Main St. in downtown Ventura. Oct. 7th at 7pm I’ll be speaking to residents of Vista Del Monte. 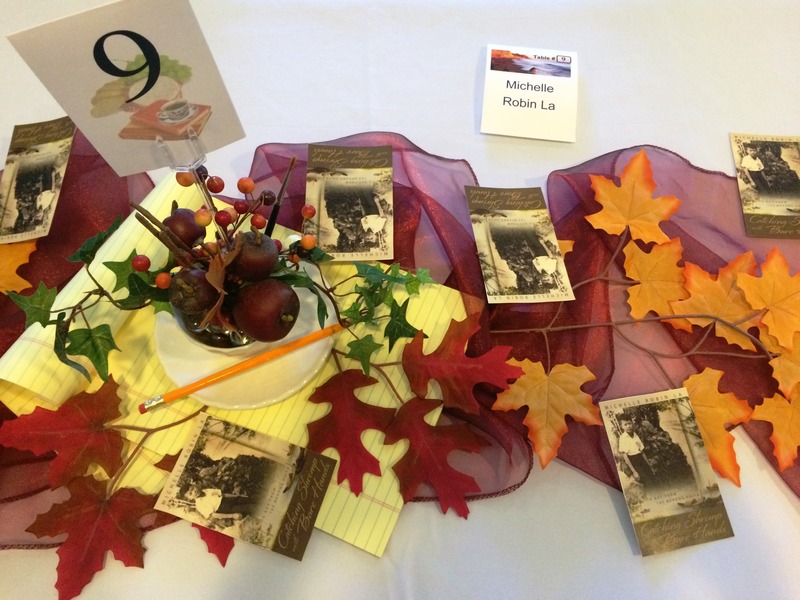 Saturday, Oct. 3rd from 10am-1pm, I’ll be a guest author at the SBCEO Breakfast with the Authors. Look here for tickets. “Flickering Little Lights,” a piece about catching fireflies in the Mekong Delta, is forthcoming in Issue 29 of Cha: An Asian Literary Journal, due out in late September. I’ll be a guest author for downtown Ventura’s E.P. Foster Library event “Focus on Writing: Fiction and Non-Fiction” Saturday, Sept. 12th from 2-4 pm in the Topping Room. 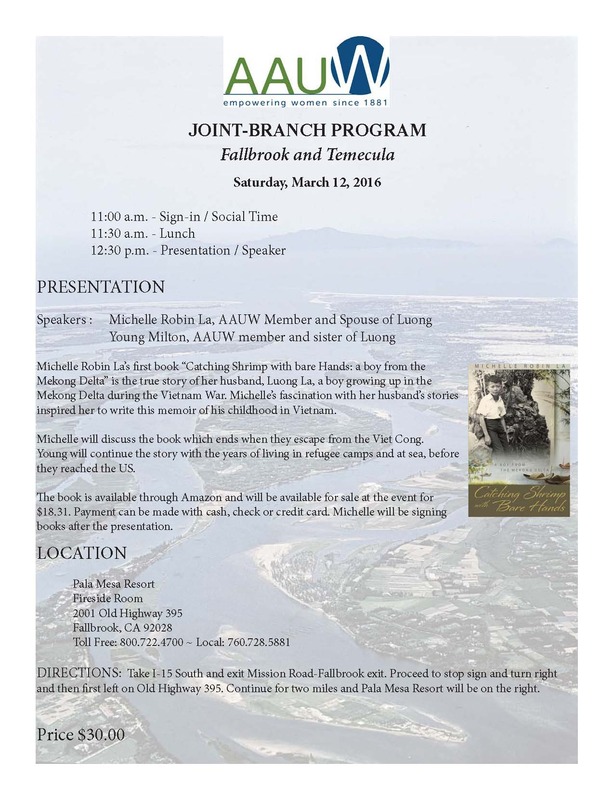 Sept. 3-4, I’ll be visiting Fallbrook, CA to talk to their AAUW branch (3pm Sept. 3rd in the Fallbrook Library–Catching Shrimp with Bare Hands is their August book pick) and to Fallbrook High School students (in the library at noon on Sept. 4th). 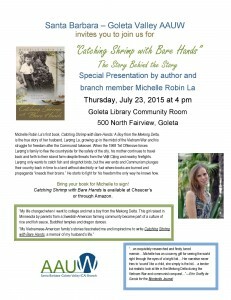 Catching Shrimp with Bare Hands is the Santa Barbara – Goleta Valley AAUW Book Club’s August pick. The Museum of Ventura County “We Remember: Ventura County to Vietnam and Back” a tribute to the county’s Vietnam veterans, as well as those who didn’t make it home, runs through Aug. 9th. 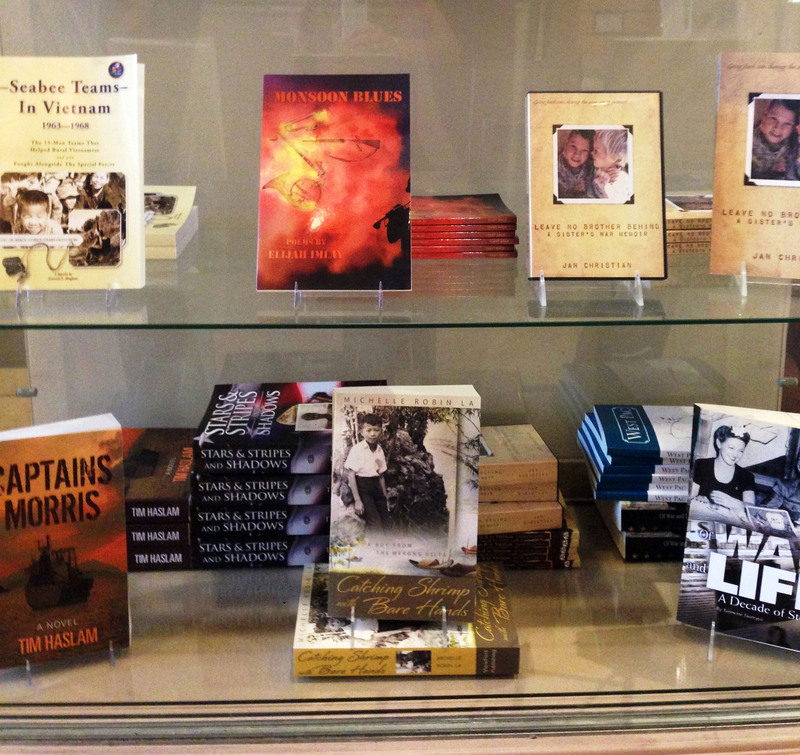 Catching Shrimp with Bare Hands is in the Museum store along with books from some of these veterans. I talked with Literary Gumbo TV host Fred Klein about my book. Watch the interview here. June 29th, the Santa Barbara Yacht Club has invited me to speak at its Monday Luncheon Forum. 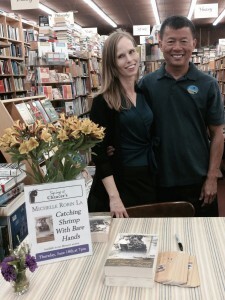 Erin Graffy de Garcia reviewed Catching Shrimp with Bare Hands in her “State Street Spin” column in the June 18-25 edition of the Montecito Journal. **BOOK SIGNING** Thursday, June 18th 7pm at Chaucer’s Books. I hope to see you there! 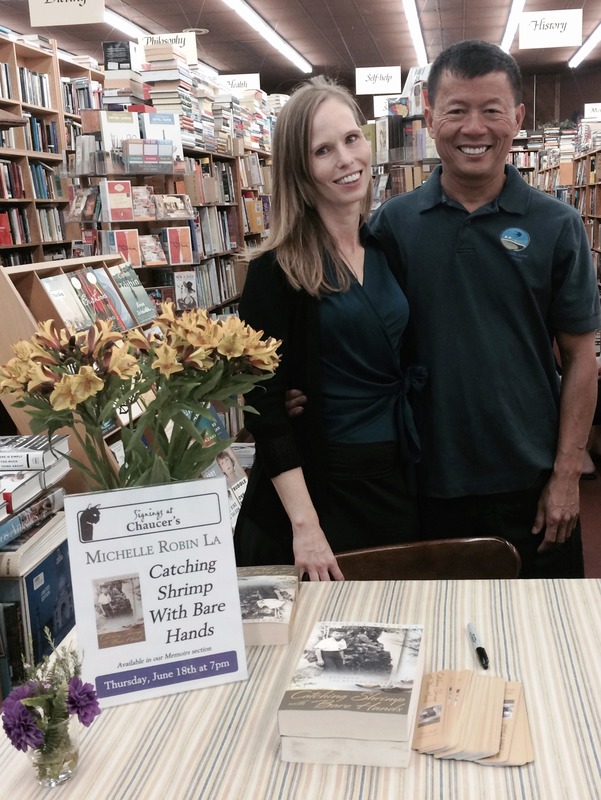 Thanks to Santa Barbara Seasons Magazine for featuring Catching Shrimp with Bare Hands on its blog this month. 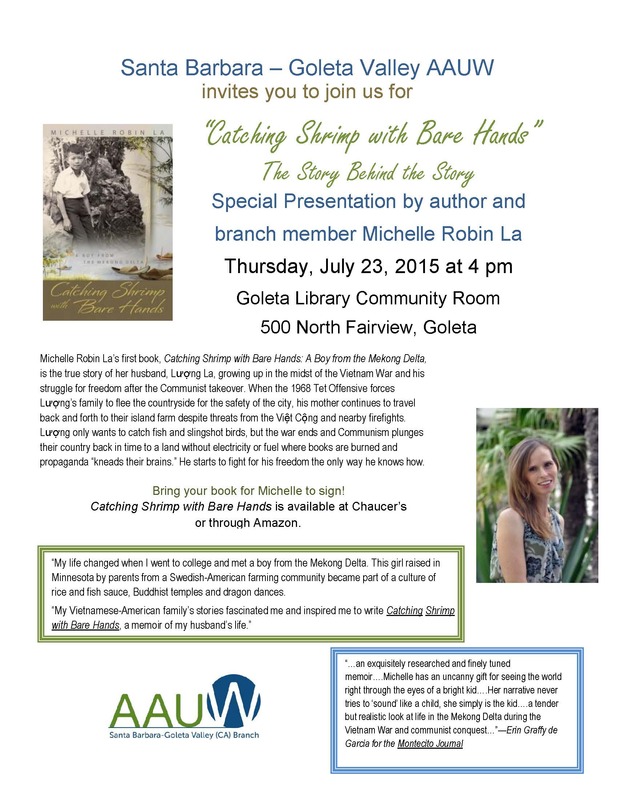 June 9th 12:30pm I’ll be the speaker for the Las Aletas Book Club meeting at the Assistance League’s Chapter House at 1259 Veronica Springs Road. 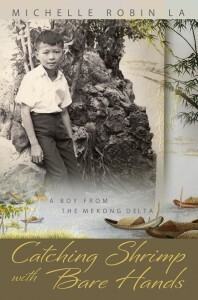 “Patrol Boat Stop on the Mekong River,” an excerpt from my book, is a first-place winner in the Southern California Genealogical Society’s 2014 GENEii Family History Writing Contest and will be featured in SCGS’s The Searcher. My creative nonfiction piece “Open Closed Eyes” appears in Mom Egg Review Vol. 13. 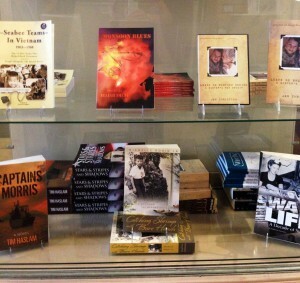 Author Talk on Creative Nonfiction at the Music and Arts Conservatory of Santa Barbara February 21st. Catching Shrimp with Bare Hands: The Boy from the Mekong Delta is now available.